I’ve never actually seen myself run. I mean, I’ve seen pictures of me crossing a finish line; sweaty, pained face, making a bee line for the piles of bagels and orange slices, ready for a cold gulp of water and a hot coffee in my hands—but seeing me run, in motion, I’ve yet to experience. I’m not so sure I want to. Many times on my runs I judge and evaluate other runner’s gaits, I think ooooh, she shouldn’t be in that Nike Pegasus. Or look at that guy’s calves…dang! But I also notice the way a runner’s legs move, some bow legged, some knock kneed, some don’t even bend their knees, it looks painful in some ways. All of this observing makes me wonder what the heck I look like. Do I look like a runner? Or do I look like one of those out of shape people struggling through a few miles? Do I run with the look of ease or like I’m about to have a hernia and need to be taken to the hospital? I try to sneak a peak at my stride when I run by a window-mirrored building in the city. Quick looks over my shoulder. That messes up my stride. I slit my eyes and peer out of the corner. I usually almost trip when I try this method. All I can really end up seeing are my white legs, pink at and black jacket—no form, no method, and no proper evaluation of my stride. Maybe this is for the better. I don’t want to know if I run knock kneed or bow legged. This way I can go on pretending that my stride is as good as I feel that day and as long as I log the miles it doesn’t matter. 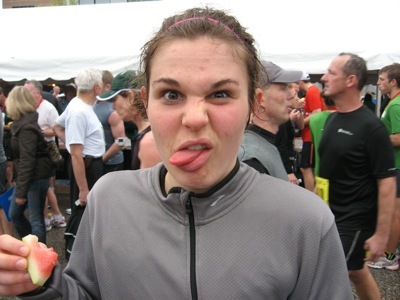 …Though I secretly hope I’m the runner that makes other runners ooooh and ahhhh. How great to hear from you and find out that the recreation part of your life hasn’t changed. I found myself in your blog: “out of shape runners struggling….” my addition to this would be…with a short, slow walk to the end of the driveway and back. 🙂 Glad you are blogging. Keep it up Grandma! You have to get the mail somehow, right?! Miss you!